Credit: Port of London Authority/TW/Ben Fitzpatrick. 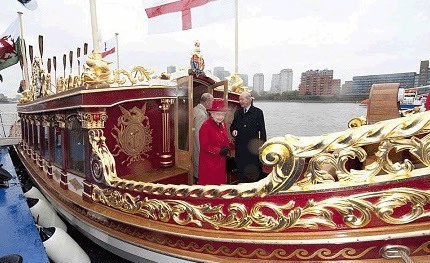 Her Majesty The Queen named the Royal Rowbarge Gloriana as a lasting legacy to mark her Diamond Jubilee. Her Majesty has asked that Gloriana be retained by Lord Sterling and the new charitable trust for Gloriana with assistance from Thames Alive and has approved the principle that Gloriana will be used to promote better use of the Thames. This will be achieved through providing opportunities for Royal-supported, and other charities, to play their part in occasions and celebrations upon the Thames, with a particular emphasis on events involving young people. 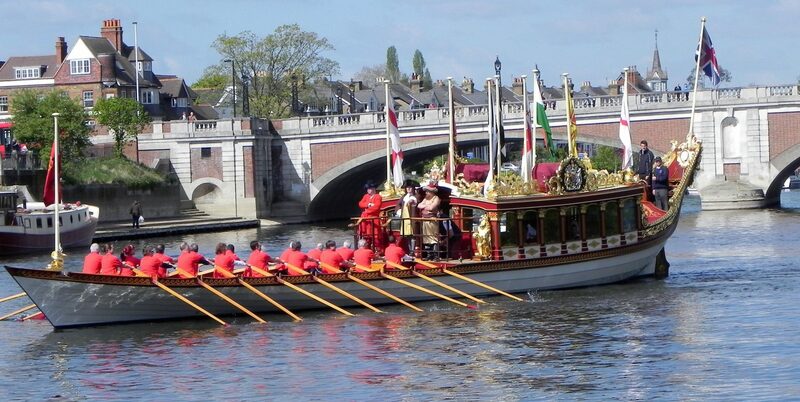 Gloriana The Queen’s Rowbarge is a lasting legacy of The Queen’s Diamond Jubilee in 2012. Her immediate realm is the River Thames and London, but Gloriana also celebrates the Commonwealth, which delivers a truly international dimension to her presence. 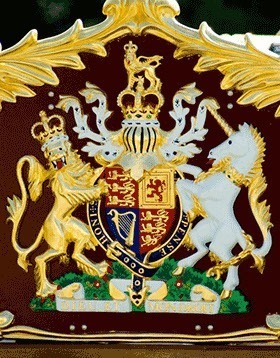 The crests of 16 Commonwealth countries adorn the outside of the coach. Gloriana is an inspiration for national pride, a showcase for traditional British boat-building and craftsmanship, and a means of encouraging people, especially young people, to engage with the River Thames and the sport of rowing. Lord Sterling and the Trustees of The Gloriana Trust are most grateful for the splendid support provided by The Maritime Heritage Trust and in particular by their Chairman, David Morgan, from the early stages of design and construction through to the setting up of The Gloriana Trust. After more than six years playing a central role in Gloriana’s attendance at prestigious events up and down the River Thames, Malcolm Knight, our Events Manager, has decided to step down from his role. All those who have rowed in and supported Gloriana will wish to join in thanking Malcolm for his tremendous hard work over the years. Malcolm has worked tirelessly with the many organisations who have played a part in Gloriana’s activities and has been responsible for much of the detailed work that goes on behind the scenes for every outing, from arranging crew to identifying suitable and safe moorings, filing passage plans to polishing the brass. We are all enormously grateful to him and wish him well for the future. We are pleased to welcome Keith Baldwin to the Gloriana team. Keith will take on the role of General Manager, Gloriana Services Ltd. He will be a key contact for those who wish to arrange events or offer support to Gloriana. Keith brings much experience of the River Thames from his time as a competitive Masters rower, which still continues. He was also President of his rowing club (Twickenham Rowing Club) during a period of rebuilding of the clubhouse and also brings much business experience. The rest of the Gloriana Team will continue as before. Please contact us either via the Website Enquiry Form or by email at events@glorianaqrb.org.uk. 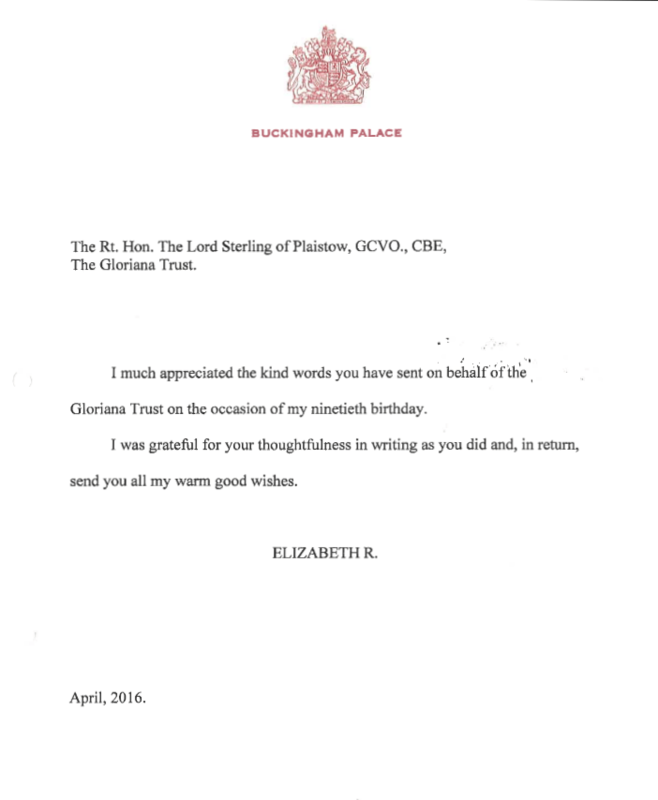 May we take this opportunity to wish Her Majesty Queen Elizabeth II many congratulations on your 93rd birthday - long may you reign over us!! A very successful season, thank you to everyone who helped make it possible and so much fun. To all our supporters, rowers and those who just like to see the Royal barge out on the Thames - Best wishes for a joyful Christmas and a Peaceful New Year. Gloriana has now left her summer home moorings in St. Katherine Docks (thank you for taking care of her so well!) and made her way downstream to her winter storage facility courtesy of the Port of London Authority where much needed maintenance will be carried out over the coming months. Please check back for updates and the plans for the 2019 season. Thank you to everyone for your support, we look forward to seeing you all on the River Thames in the spring of 2019. Gloriana coming upstream under Waterloo Bridge for the Armistice Day 100 flotilla - splendid timing crew! Britain is famous across the world as a country rich in heritage and pageantry, and our strong naval traditions are carried on by a history of sporting success in rowing. This vessel unites these two strengths very neatly in this Jubilee and Olympic year, and I very much look forward to seeing the finished article on the river and joining Steve in the boat.